JSFiddle is a fantastic prototyping and code review tool. It’s great for getting out a quick test case or code concept without having to spool up your full tool chain and editor. Further, it’s a great place to paste ill-behaved code so that others can review it and ideally help you get at the root of your problem. 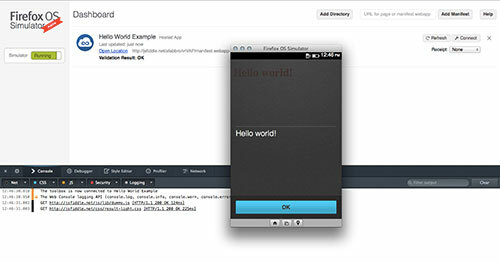 Now you’re able to not only prototype snippets of code, but Firefox OS apps as well. We’re very excited about this because for a while now we’ve been trying to make sure developers understand that creating a Firefox OS app is just like creating a web app. By tinkering with JSFiddle live in your browser, we think you’ll see just how easy it is and the parallels will be more evident. 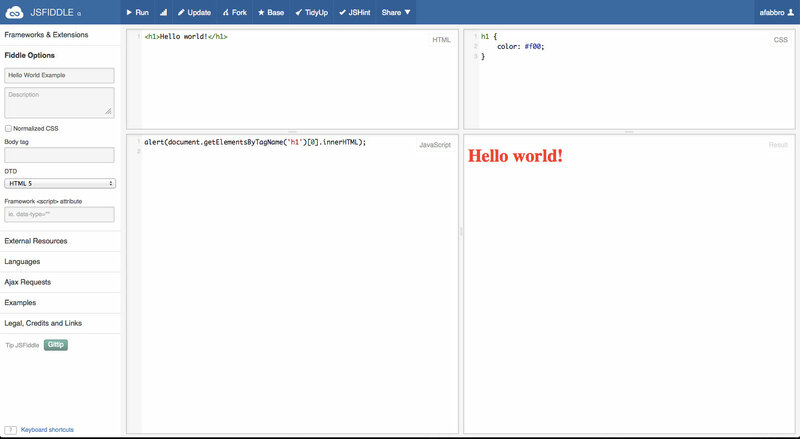 I’ve created a demo JSFiddle here that we will go over in detail in the next section. Copy this URL to your clipboard. Depending on your browser behavior, it may or may not copy with ‘http://’ intact. Please note that the simulator will not accept any URLs where the protocol is not specified explicitly. So, if it’s not there – add it. The simulator will highlight this input box with a red border when the URL is invalid. If you haven’t written a manifest for a Firefox OS app before, viewing this auto-generated one will give you an idea of what bits of information you need to provide for your app when you create your own from scratch later. Paste the URL that you copied into the field as shown below. As mentioned previously, the field will highlight red if there are any problems with your URL. After adding, the simulator should boot your app immediately. You can see that after we dismiss the alert() that we are at a view (a basic HTML page in this case) with a single red h1 tag as we would expect. Click install, and you should find the app on your home screen. This JSFiddle hack comes to us courtesy of Piotr Zalewa, who also happens to be working on making PhoneGap build for Firefox OS. Let us know what you think in the comments, and post a link to your Fiddle’s manifest if you make something interesting that you want to show off. It is a good start for anyone to get started with FireFox OS. Though I had FireFox OS simulator for a month, I couldn’t build an app as quick as this mechanism. The first option of “webapp.manifest” worked awesomely. But the “fxos.html” option does not download the app http://jsfiddle.net/vedabalan/Gt3MY/fxos.html. Yep it works now – with no change in any form! This is a really good idea. Love it! Thanks for the step-by-step. It worked for me up until I tried pasting your http://jsfiddle.net/afabbro/vrVAP/manifest.webapp link into Firefox OS Simulator and the simulator starts up but the app doesn’t run.